Do you remember what you were doing at the age of eight? Was it something like playing with dolls, roller skating or watching tv? Children in other countries or in other situations have a different kind of childhood. Adrian is a member of the nonprofit, Roll Out The Barrel organization. He tells us about a different kind of childhood for a lot of children – boys and girls. Many of us are in shopping mode with the Christmas holiday coming up. Remember that you can give someone else a gift in honor of someone else. So, if you a buying a gift for someone who already has everything, maybe you can donate to an organization and give that person a card indicating that a gift was made in their honor. That’s the kind of gift I would love to have. They’re the best kind! This is about she who will become a woman, a different woman because she will no longer have to carry the family’s water. Recently Stewart and Diane Mackie, from Rothwell in the UK, who are associated with the scouting movement asked if they could take a couple of Rotary barrels with their luggage on their 28th trip to Uganda and the Mackie School. Stewart and Diane travelled up country about 30 miles. They found a young girl, Edith, collecting the family’s water as she does every single day, three times a day. Straight away they gave her a barrel to fill at the pump which she then rolled home within 10 minutes instead of 45/50 carrying and dragging. 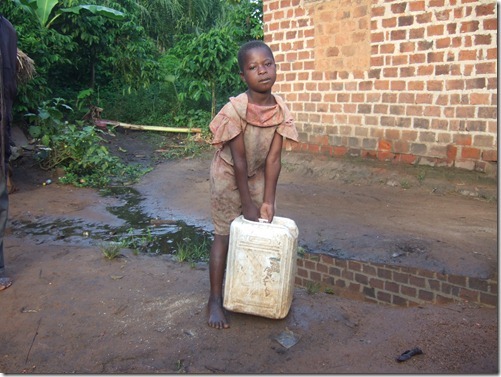 Her 3 younger brothers and sisters will never need to carry water as they grow. Another barrel into this family will further improve health and well being and give all the children the opportunity to be educated properly. With the next barrel we will be sending some flip flops or even shoes….! Join Us. One barrel makes a real difference and you CAN change lives, forever! Who Cried for the Little Boy? – Ellen Did. February 4, 2013 tomaca Comments Off on Who Cried for the Little Boy? – Ellen Did.